Dimensions 11.42" x 3.94" x 1.68"
Ever since I purchased my first V60 keyboard, I have been badgering KBP with requests to produce a completely programmable keyboard. They have finally done so, but with so little fanfare that I missed the initial launch. No doubt they made the announcement on the KBP Facebook page, but I seldom use this form of social media. After my most recent clamoring on Massdrop, someone pointed out that my wish had been granted, informing me that KBP's completely programmable board had been out for some time and in two flavors: the V60 Type R Polestar with RGB LEDs, and the V60 Type R with only a single LED for the CapsLock indicator. Both types of V60 Type R are available from MechanicalKeyboards.com (MK). In fact, they had been listed with MK for some time without indicating that they were completely programmable. I sent them a note pointing out the programmability, and they added this very important information to the product descriptions on their web site. 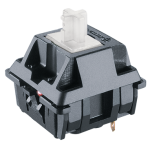 Prices range from $99 to $119 depending on LEDs and the variety of Cherry mx switch. Mine was $109 for the non-LED model with Cherry mx Green switches. Shipping is free, at least within the continental US. Dutifully following the instructions -- including the tip about having a second keyboard plugged into my computer -- I was able to get my V60 Type R programmed to my satisfaction on the first try. Multiple function layers are possible, which would be helpful for controlling the various LED options in the Polestar model, but I kept my setup simple, with a single Fn layer. Programming is easy -- After pressing the reset button underneath the keyboard, you simply type your desired key assignments onto a graphical layout furnished through a web page, copy and paste the automatically generated code into a designated window, download the resulting keyboard configuration file, and drag and drop the configuration file onto a batch file that flashes the keyboard controller for you. My V60 Type R now has a HHKB-like layout. I was very pleased to discover that I was able to remap the original Fn key, and, unlike the situation with the Vortex Pok3R, the KBP V60 Type R permits remapping of the Right Control key (which I remapped as Fn). Switches. Apart from the programmability in the Type R, which is excellent, or the RGB LEDs in the Polestar variant, the Type R is still a V60. Thus far, the switch options of the Type R only include Cherry mx (Red or Grey Linear, Blue or Green Clicky, Clear or Grey Tactile). 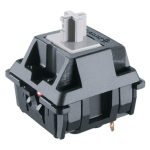 As yet, the Type R is not available with Gateron or Matias switches. I hope that KBP will add Gateron and Matias options to their Type R lineup. Stabilizers. Like the standard V60 with Cherry or Gateron switches, the Type R has Cherry stabilizers, which to me feel mushy. I much prefer the wire Costar-type stabilizers, like those that KBP uses in their Matias-switch V60 models. Vortex has modified the Cherry-type stabilizers in the Pok3r, and they feel less mushy than the standard Cherry stabilizers in the V60 and V60 Type R. The stabilizers in my keyboard were also a bit rattily, but this was satisfactorily addressed by lubricating them with some Superlube 21010 synthetic grease. Case and Connector. The non-LED model has the standard V60 plastic case. The LED model (Polestar) has a translucent case with a diffuser layer for the light show. I haven't tried the Polestar, but I like the standard V60 case on my keyboard -- it provides more of a resonant chamber than a flat metal case does. There are no flip-out feet, but there are four non-skid pads and the case is sloped to provide a comfortable typing angle. Nevertheless, I added some self-adhesive rubber feet to increase the angle. The connector is mini-USB located in the left rear corner of the case. Keycaps. The stock keycaps are pad-printed ABS that include front-printed legends for the default layout. I find the legends too small and unattractive, and the raised pad printing has a distracting feel. I changed the keycaps, using a mix from sets of OEM profile thick dye-sublimated PBT caps from Ducky. The alphas are black on cream, most of the mods are dark gray, and the two accent keys (Esc and Fn) are black on blue. I also silenced the spacebar somewhat by placing a red 40A-L 0.2 mm O-ring on the center stem. To my eye and fingers, the new caps look and feel much better than the stock caps, but I think the keys sounded better with the thin ABS caps -- thick PBT is sometimes overrated in this respect. KBP has taken a great step forward with the V60 Type R by adding true complete programmability. For those who like Cherry mx switches and Cherry stabilizers, the basic V60 is a serviceable keyboard, but the total programmability provided in the Type R elevates the V60 to a new level. However, I would like to see KBP expand the Type R line by adding options for Gateron and Matias switches. In addition, I believe the feel of the keyboard could be improved by changing the stabilizers from Cherry to Costar-type or at least making this an option. Alternatively, they could look into modifying the Cherry stabilizers as Vortex has apparently done in the Pok3r to make the stabilized keys feel less mushy. KBP should also consider providing choices for higher-quality keycaps and/or a barebones no-keycaps option. RGB LEDs just for a lightshow would not be a priority for me, but I would consider functional backlighting, which is already a component of the Polestar variant of the Type R V60. Finally, although I am fine with the stock plastic case, there are those who prefer a high-quality aluminum case, but unless this could be done without a substantial increase in price, it might be best to forgo this option and leave it up to the customer to add an aftermarket case. Overall, I like the V60 Type R, and I give very high marks to KBP for making the V60 fully programmable.